The Walking Dead returns for its mid-season premiere picking up where it left off, not giving immediate answers about the new threat, but also showing some quietly powerful scenes with Negan. The first episode of 2019 sees Michonne, Daryl and the others fight against the new breed of walker-mask-wearing-humans, viciously defeating them and taking one back to Alexandria for questioning. They also mourn the death of Jesus and bring his body back to the community so that he may be remembered properly. Daryl also manipulates Henry (still annoying as ever) into “befriending” a captured Whisperer girl named Lydia, hoping to learn more about her group. Hopefully, they get more intel on this new threat before more danger hits. At the very least, they are already on alert. Newcomer Luke decides to go out of Alexandria with former Savior Alden and they make quite a pair, new characters who at least don’t seem as bleak as the rest. In such a short time, I have grown quite fond of Luke, the old musician, as he possesses a certain charm despite clearly having survived great hardship. The rest of his group also seem to be integrating better with the Alexandrian community, which will be of great help when the new villains start to cause trouble, especially after they capture Luke and Alden at the end. It’s yet another meandering episode of The Walking Dead which comes as no surprise. 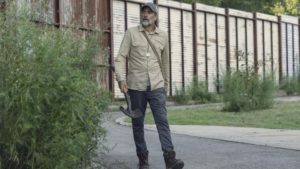 What is surprising is that the most compelling part of this episode are the slow, quiet moments when the newly-escaped Negan explores the world outside. Young Judith (as tough as ever) warns him that there is nothing out there for him and for a while he does not believe it. He wanders around, free at last after all those years in captivity, but finds an empty world. Everyone he once knew has turned into a walker. The fight has gone out of him,and he realizes that Judith was right. The young warrior does as she promises and shoots him off his bike. But he is grateful to have crossed paths with her again and is willing and even eager to return to Alexandria. Their strange friendship has been a fascinating development and Negan’s interactions with Judith have been genuine enough. 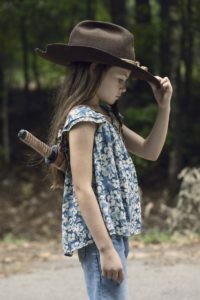 As another reviewer notes, Negan realizes that he values the human connection he shares with Judith, such as it is, over the emptiness of freedom in the wasteland of The Walking Dead. 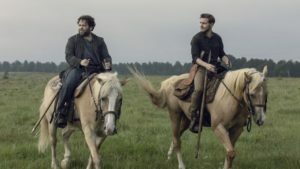 It looks like the show will is determined to build up to the introduction of The Whisperers, though their confrontation with Luke and Alden is potential for some carnage and conflict. The story has moved forward enough though it still included some soap opera elements like Eugene trying to confess his love to Rosita and then him overhearing Rosita revealing that 1) she had a fling with Siddiq before she got with Gabriel and 2) she is now pregnant. Looks like a lot really has happened in the last few years. I’d still have rather watched more of Judith and Negan than this weird and unnecessary relationship drama.